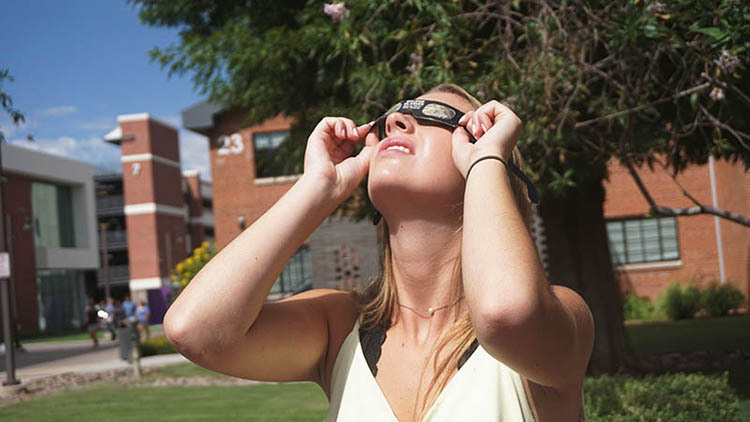 The solar eclipse Monday morning was an exhilarating spectacle for hundreds of Grand Canyon University students and employees who braved the heat to safely view it outside GCU Arena. The partial eclipse was a dramatic view that stunned many. In Phoenix, the moon covered only 60 percent of the sun, but it still was a breathtakingly beautiful sight. From one generation to the next, no matter whether the view has a passion for science or was just curious, the reaction to the solar eclipse was almost the same. The eclipse viewing party was hosted by the newly formed Astronomy Club. It didn’t take much for Secretary-Treasurer Denisse Delos Santos to convince passersby to try on solar shades and turn their faces toward the sky. Four telescopes also had been placed on the corridor to make viewing the sun safe for the eyes. 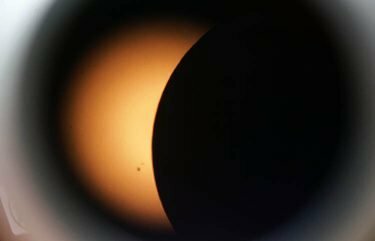 Delos Santos explained that what made Monday’s eclipse so special was that the solar eclipse cut diagonally across the entire United States. The last time a total solar eclipse swept the width of the U.S. was in 1918. “We don’t get the full coverage in Phoenix, but it’s great that we get to share this experience with other Lopes and before generations,” Delos Santos said. An image of the solar eclipse as seen from one of the telescopes at the viewing party. 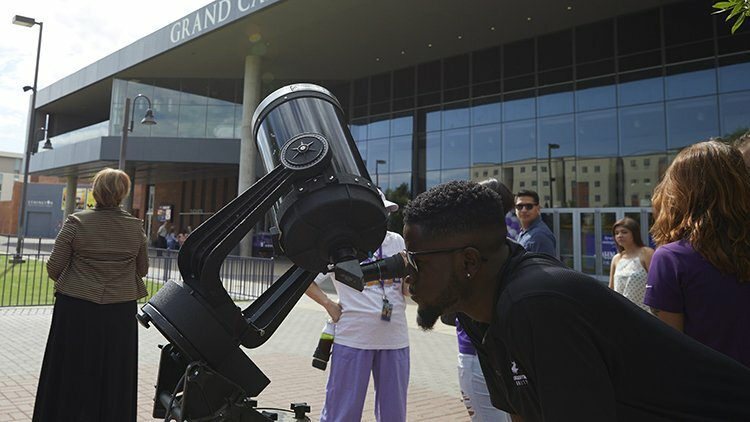 “I have never heard ‘wow’ more times than I can count,” Astronomy Club President Christian Clifton said. Clifton helped spectators get in position for a peek and rotated the telescopes to match the rotation of the sun. 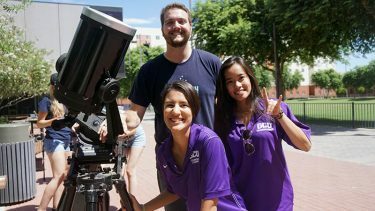 Some students asked Vice President Bianca Georgi if they could photograph the eclipse from the telescopes with their smartphones. As the eclipse reached closer to its peak, the sky turned slightly cloudy, and it was several seconds until the sun poked through a gap in the clouds again. 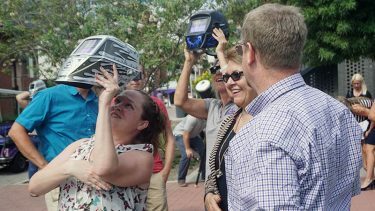 Hundreds more viewers clustered to witness the scene and alternated between hugs, gasps, cheers, watching the eclipse and posing for photos. Stephanie Paluch, a College of Education faculty member, could not believe her eyes. “It’s a little surreal especially because it is so cloudy and a little scary,” she said. Astronomy club members – President Christian Clifton, Vice President Bianca Georgi (foreground) and Secretary-Treasurer Denisse Delos Santos – hosted the eclipse viewing party Monday. Senior Sara Stoner passed around her “solar eclipse glasses” among her friends. She said she had received them while visiting NASA in Washington, D.C., this summer and couldn’t sleep the night before, anxious and afraid that she would miss the viewing party. “I never thought we’d be able to see a solar eclipse, and it’s really fun to get to experience it together,” she said. Clifton called the viewing of the celestial phenomenon a success. “The three of us who started the Astronomy Club have a passion for space and everything else out there. We want to share this passion with other people,” he said. Great feature of the good work Christian, Bianca, and Denisse put forth to display and excite the crowd. Wonderful start to what I am sure will be a stellar future for the GCU Astronomy Club. They have already got the Lope Scopes, Up!